This morning I’ve been thinking about the context of Daniel’s life. He had been living in exile since his youth. It is likely that his family starved to death or were slaughtered in the siege of Jerusalem where he witnessed horrific atrocities. He was little more than a slave to his captors. He may have earned their respect, but he never escaped the hatred and discrimination of the people he served. He had survived the insane rages of Nebuchadnezzar. He had witnessed the divinely appointed downfall of Belshazzar. He was now living under his third foreign monarch and yet another group of power hungry middle managers scheming his destruction. Through it all he was a stranger in a strange land, despised by his foreign peers, and misunderstood by virtually everyone around him. His entire life, Daniel held firm to one thing: his faith. It did not surprise me this morning when I read that upon reading Darius’ decree, Daniel simply went about doing what he had always done. Daniel had seen rulers come and rulers go. He’d continually witnessed and experienced their silly, ego-driven edicts. Through all of the massive political transitions he had survived, Daniel understood that he served and was answerable to a higher authority who did not lose His throne to the next despot. 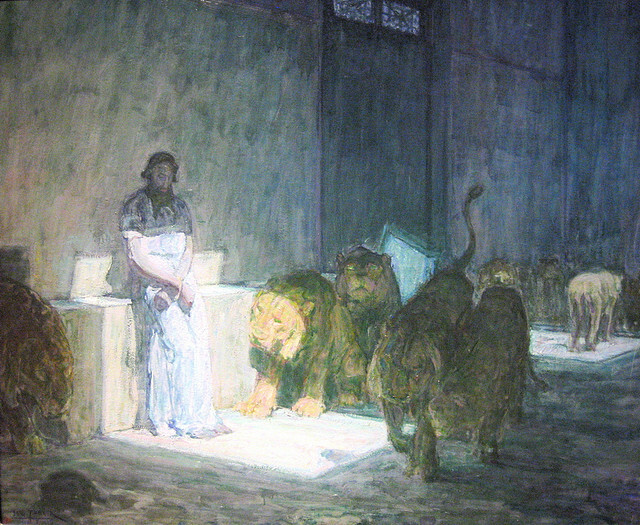 The threat of the lions den may have been very real, but by the time his political enemies sprung their trap, I find that Daniel responded with an almost fatalistic detachment. He held loosely to the things of this world. When Belshazzar offered him riches for his interpretation in yesterday’s chapter, Daniel told him to keep them. The only thing Daniel really cared about was the one thing that had gotten him through, and that was his faith. He was not going to stop praying even if it did mean being devoured by lions. I wonder if, by this time in his life, there was a part of him that would have welcomed an end to his earthly exile. This morning I’m thinking about this earthly journey. I’m thinking about how my own personal thoughts and priorities have changed over time. There are things to which I once clung, but now hold rather loosely. There are things which I prize more than ever that have little tangible, earthly value. When I was young I thought of Daniel as a man of super-hero style courage, but I think I misunderstood him. I’m beginning to believe that the Daniel who was thrown to the lions was simply a wise old man who was tired, who wanted only to be left alone to live out his faith, and who didn’t really care anymore what anyone did to him. I struggle sometimes when I read passages like this. Does this imply that people who cry out to God in times of trial and DO get hurt don’t have enough trust in God? I don’t know. I guess that’s over thinking it. Clearly God has the ability to protect like He did in this story. It’s a story, put to song, remembered from childhood, that gives a youngster an AWESOME perspective of what God can do.